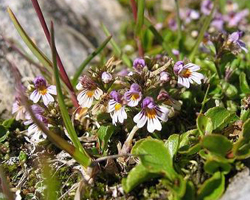 Characterized by small flowers that resemble bloodshot human eyes, eyebright is a plant that is native to Europe. It grows abundantly throughout Britain, although can be found throughout the continent and into North America as well. The flowers are usually white or purple with a yellow tinge, and might have patterns that are similar to eyes. For this reason, eyebright herb tea was often given as a remedy for eye infections or vision problems during the middle Ages. However, this medicine is still used as a folk remedy, particularly in Eastern Europe, in both a topical and tea form. While there have been no conclusive tests that prove why eyebright herb tea and poultices might be effective in treating eye disorders or infections, there are several chemical compounds found within the plant that might indicate why it's effective. Eyebright tea contains caffeine, aucubin, ferulic acid, choline, and other chemicals that have been shown to kill certain bacteria. If you do decide to place eyebright directly on your eye to draw out an infection, be careful that everything you are using has been properly sterilized, or you could in fact experience worse damage. 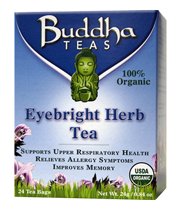 This is why taking eyebright in a tea form is the safest way of seeking relief. Another benefit that can be found in a cup of eyebright tea is that it can be useful to those who are looking for a natural method of relief for common allergies. Drinking this tea regularly can help support the immune system, helping to build your body’s resistance to unwanted allergies as well as minor afflictions such as the common cold. Eyebright tea can also help reduce some of the symptoms that are brought about by seasonal allergies. 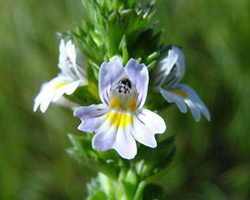 There are a few other benefits that can be taken from a good cup of eyebright tea. Drinking eyebright tea can help with memory improvement, as a result of the beta-carotenes present in this tea. Studies have shown that beta-carotenes have the potential to strengthen cognitive performance. The antibacterial properties that are present in this tea also make it a good candidate for applying topically to irritated areas of the skin. To prepare eyebright herb tea, it's recommended to take one tea bag of eyebright tea and combine this with one cup of hot, not boiling water. You can then let this steep for several minutes, and flavor it with lemon and honey if desired to bring out the flavor and have a smoother experience. It's recommended to take two to three cups of this tea per day. Goldenseal is another herb that is commonly combined with eyebright, for cold and flu relief. As with any herbal remedies, if you plan on continuously taking eyebright herb tea as a means of curing eye infections or clearing up blockages in the body, you should check with your doctor first to be sure that this is a good idea, and to have your infection properly diagnosed. Something like conjunctivitis could lead to greater eye damage over time if not treated properly. However, taking eyebright internally is the safest way to experience its benefits. If you are interested in trying eyebright tea, you may find this tea for sale at a local health food herbal store. However, eyebright tea may be hard to find for sale locally in some areas which is why it may be more convenient to purchase this tea online. When you are considering teas online, it is very important that you choose a reliable tea merchant that you know you can trust to send you good quality herbs and teas. 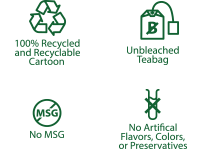 This is why we highly recommend Buddha Teas as a safe, organic online store where you can take assurance knowing you’ll be receiving high quality herbal teas and tea blends. We truly hope this article has been useful to you and able to answer any questions you may have regarding eyebright tea. If you have any further inquiries however, you are always welcome to contact us for additional information. Eyebright tea is a helpful herbal tea that can be useful for supplementing the eyes, aiding allergies, and more.